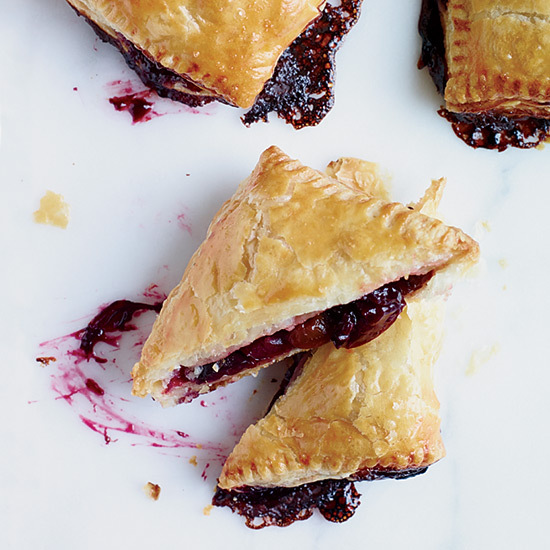 Here, seven tried and true cherry pies, pastries and other sweets that can be made in a flash using this week’s Mad Genius Tip. While cherries can make almost anything better, they shine the brightest at the end of the meal in fruity, springy desserts. Here, seven tried and true cherry pies, pastries and other sweets that can be made in a flash using this week’s Mad Genius Tip. At first glance, this appears to be a very classic cherry crumble, but there are three genius details that add layers of delicious flavor. First, the topping is made with whole wheat flour for a rustic character; second, a splash of balsamic vinegar adds complexity; third, grated pear is mixed into the filling. Small, juicy, rube-red cherries are excellent for baking because, unlike sweet cherries, they retain their shape as they cook. Almond flour gives this custardy French dessert terrific texture. This classic early summer pie features sweet cherries along with raspberries and blueberries. Thick mascarpone cheese mixed with honey makes a luscious topping for poached cherries. You can serve the dessert either warm or cold. Kriek—lambic beer fermented with cherries—intensifies the fruit flavors of the fresh dark cherries and dried sour cherries in these crisps.